There's nothing like real-world data to put all of our industry's promises of LED and luminaire longevity in perspective. The US Department of Energy's GATEWAY program provides such real-world data on installed LED lighting projects. 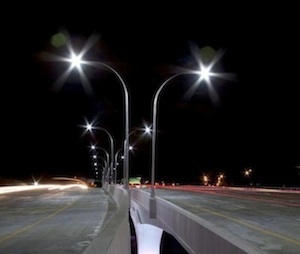 A new GATEWAY report (brief here) examines the performance of street lighting installed on a freeway bridge in Minneapolis, MN, five years after installation. Two luminaires had been subjected to laboratory testing before being installed on the bridge in September 2008. Those same two luminaires were removed in the spring of 2014 and transported to a testing laboratory, where they were tested as-is, cleaned, then tested again. The results: After about 20,300 hours of operation the luminaires had suffered 18% decrease in light output attributed to ordinary lumen depreciation mechanisms (phosphor degradation, etc. ); an unexplained 4% reduction in input power; and a 15% reduction in luminaire efficacy. In addition the luminaires dropped in CCT by about 800K, increased in Duv by 0.01 (moving farther above the blackbody curve, towards yellow-green), and dropped slightly in CRI and significantly in R9. The effect of dirt accumulation over five years further reduced lumen output by 12%, and distorted the light distribution pattern. These luminaires date from the dawn of the LED lighting age. They were manufactured by Ruud Lighting's BetaLED division using Cree LEDs (XR-E, generation Q5 chips) with drivers supplied by Advanced Transformer. They are only about 13% more efficient than the high-pressure sodium lights they replaced. They are among the longest-serving outdoor luminaires in use. At the time of installation, the manufacturer expected a useful lifetime of 20 years before the lumen output had dropped to 70% of its initial value. The five-year data indicate that an L70 of eight and one third years might be more reasonable. It is safe to assume that street lights installed in the present day would fare better after 20,000 hours. Or as the Gateway report puts it, "Readers of the report should recognize the limitations in applying long-term performance of early LED luminaires to their modern counterparts, due to continuous and ongoing advancements in the technology." That said, the Minnesota Department of Transportation has been and remains satisfied with their lights on the I-35W bridge.